Home cooked meals are the best as my mother in-law always says. We know the ingredients we use and so feel it is safe to eat. This is what I cooked for lunch today and it is a recipe I have tried several times. It turns out well everytime. 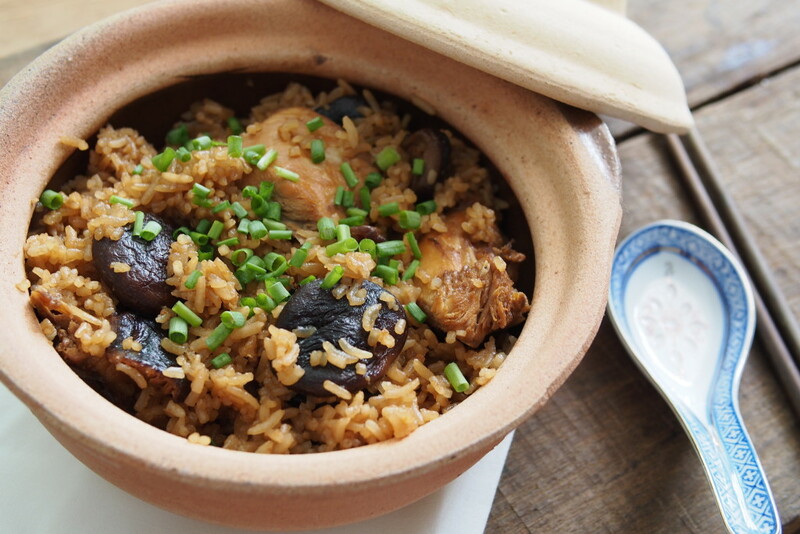 For a healthier take on clay-pot chicken rice, I used Kampung chicken (organic free range chicken) and omitted the Chinese sausage. I also used a cast iron pot instead of claypot as I find that the cast iron cooks the rice evenly without burning it. I know the best part of claypot chicken rice is the charred bottom of the rice. However, I try to avoid this because of the carcinogens. 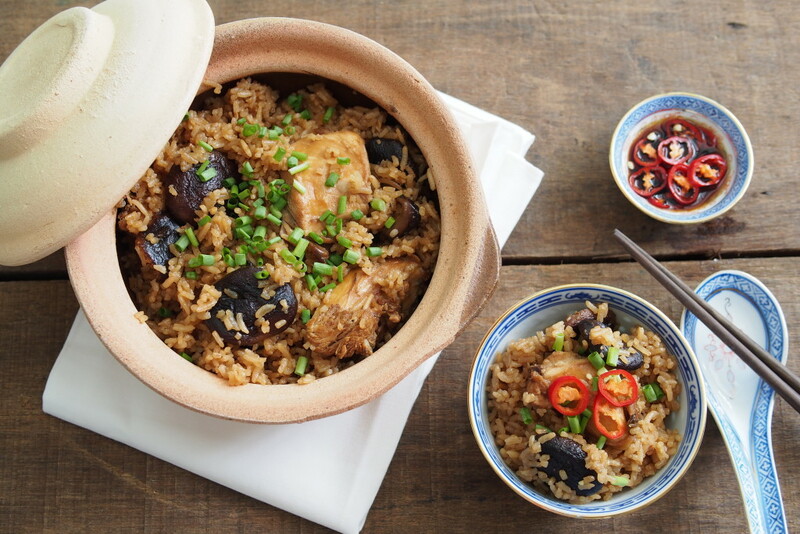 I served the rice in a claypot though, just for a more authentic touch. 1. Mix the chicken with all the marinade ingredients. Leave to marinade for at least half an hour or more. 2. Heat 1 table spoon of cooking oil in a wok and stir-fry marinated chicken meat for one minute. 3. Add mushroom and sliced Chinese sausage (optional). If the gravy is too dry, add ¼ cups of water. Dish out and put aside. 4. Put washed rice and 2 cups of water in the claypot and place it over a medium heat with the lid on. 5. 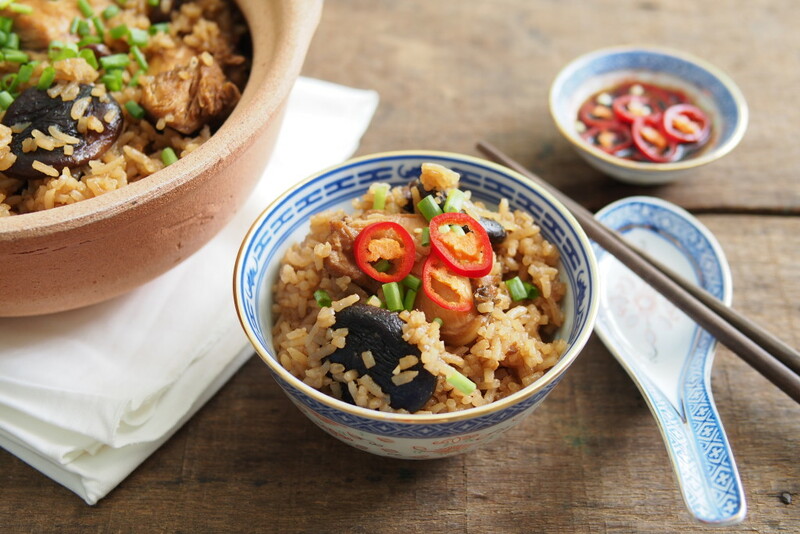 Bring to the boil and immediately reduce the heat to a low simmer, then leave the rice to steam for 15 minutes. The rice should be nearly cooked, with little holes in the flat surface. 6. 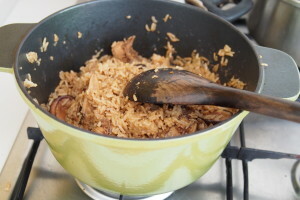 Spread the chicken mixture all over the top of the rice, and put the lid back on. Continue to steam over a low heat for another 15 minutes, until the chicken is white and cooked through. Give it a few stir. 7. Serve rice hot, garnished with spring onion. If wished, serve with a small side dish of finely sliced red chillies seasoned with light soy sauce and lime juice.